The long-time animal activist and vegetarian will perform at the Los Angeles stadium on March 1 and all the food vendors inside and around the venue will be vegetarian. According to a press release from Morrissey's representative, the former Smiths frontman asked the Staples Centre to close down their McDonald's outlets and they agreed, a request that had previously apparently been denied to Sir Paul McCartney. 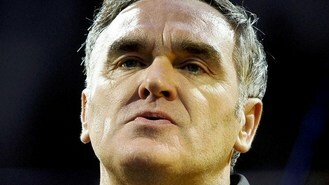 Morrissey said: "I don't look upon it as a victory for me, but a victory for the animals." The Staples Centre, which is owned by AEG and promoter Goldenvoice, will also donate a percentage of the profit from ticket sales to People For The Ethical Treatment Of Animals (PETA), of which Morrissey is a member.